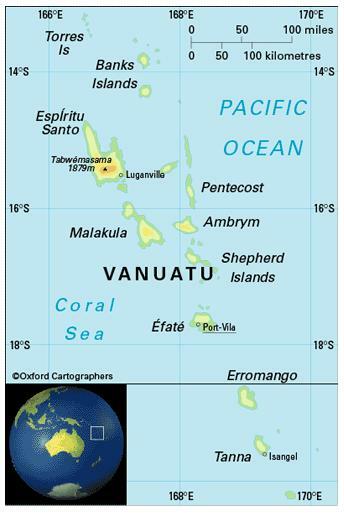 The Republic of Vanuatu’s land area is made up of a group of islands in the south-west Pacific, lying south of Solomon Islands and east of the state of Queensland in Australia. The country comprises six provinces: Malampa, Penama, Sanma, Shefa, Tafea and Torba. 247,000 (2012); predominantly concentrated near the coast on the four main islands; 25 per cent of people live in urban areas – Efaté has the fastest-growing population, as people migrate to the capital. The population growth rate stood at 2.5 per cent p.a. between the years of 1990-2012. In 2012 the birth rate was 27 per 1,000 people (43 in 1970) and life expectancy was 71 years (53 in 1970). Most of the population is Melanesian, known as ni-Vanuatu (98.5 per cent in the 1999 census), the rest of mixed Micronesian, Polynesian and European descent. Vanuatu is classified as a lower-middle-income economy by the World Bank.